It was a wonderful flying day. I took out my glider and contacted wave lift, and climbed to 10,500 feet on a day when nobody expected there to be any wave. I headed home after a very long day of flying, expecting to be fully refreshed for my first half marathon on the next day. My mother came over to be the one to drive me to the half-marathon all the way down in Fredericksburg, VA the next morning. I was reading through the paperwork, looking for information about where I could pick up my race packet. "Hmm. OK, it says here that I can pick up the race packet on Friday, but that's already passed. " I couldn't do it on Friday, because some sort of emergency happened that obviously wasn't important enough for me to remember today, a year later. "OK, it says we can pick up the race packet on Saturday, ending at 7 pm" Too bad, it was already 8 pm by that point. "There is no packet pickup on race-day"
Those words hit me incredibly hard. I didn't faint, but certainly could have! At that moment, I think I was willing to go out and play in traffic. Instead, I went outside for a walk to cool my head. What do you mean there is no packet pick up on race day!? 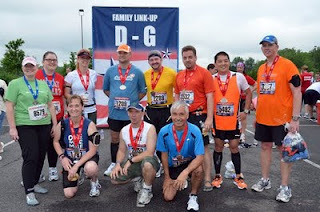 My only other race experience was the Marine Corps Run2Register 10K that was in March earlier that year. They had a packet pickup on the morning of the race, but there were only about 2000 participants there. As a running novice, it had never occurred to me that you could have a race that doesn't have packet pickup on the morning of the event. 100% of the events I had attended beforehand had packet pick up on the morning. Sure, it made sense after I thought about it -- thinking about the logistics of the event, and the difficulty it must entail -- getting all of those packets to a place where you can have volunteers show up HOURS before a race. These things make sense -- NOW. I'd even read that in the race literature months prior to the race. But for some reason, I had just not remembered that tidbit when I was doing my final planning on the days before the race. Mentally, I tried to blame everybody, but eventually accepted that the failure rested on one person: Me. ...well just a week prior to the event was Mother's day. I skipped my long Sunday run and did a 12.2 miler on the following Monday instead. A few of my Dailymile.com friends said they would be doing the Marine Corps Historic Half on Sunday. So on Thursday, (after I cleared it with the wife), I signed up! We're sorry, the confirmation number 473944239-23484329 is not valid at this time. I decided to take Friday afternoon off from work and race down to Fredericksburg to see if everything was in order. I didn't want to spend Friday at work worried about it, or ruin my Saturday morning, also being worried about it. I left work at 1 pm, and thanks to the nightmare that is Interstate 95 on a Friday afternoon, I showed up at Fredericksburg nearly 4 hours later. Google Maps says this trip should have taken 1 hour and 19 minutes. HA! 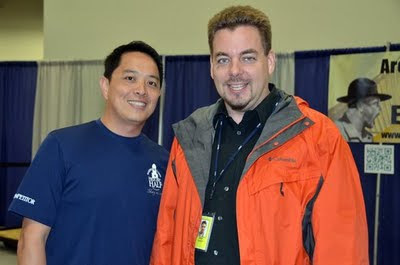 I got to the Expo, and Ray Javier was there, and picked me out of the crowd. I was still a little too nervous about the possibility of not being able to get my race packet to make any substantial chit-chat, but at least we had time for a quick photo. I got to the service desk, and they had everything under control. I was given my race bib, a nice technical tee shirt that I can use for running, and a few nick-nacks in the goodie bag. I see that there is a beer festival after the Half Marathon. Missing out on the beer tent was my greatest regret from the Marathon last year. I won't be missing it! Race morning can be quite stressful, so I decided to reduce the amount of stress by spending the night relatively close to the race. Google Maps says that a trip from my house to the race should take 1 hour and 16 minutes, but that would mean that I would have to wake up awfully early. I also am a terrible cheapskate, so I will be staying at a KOA campsite just south of Fredericksburg. Here are my race clothes for Sunday. I haven't figured out if I'll run with my favorite burnt-orange shirt, or if I'll run with the shirt I got with the race. That's my race belt with running gel (fancy sugar packets) on the left. You can see my goofy shoes on the top. I should be heading out for the drive to my very comfortable campground any minute now. It's supposed to rain all weekend, but I don't really care if it rains or not. If it rains, I'll have puddles to splash in! I have been practicing barefoot running quite regularly, but I'm not quite up to the level of being able to do a half-marathon skin-to-pavement barefoot. I'll be running in my trusty VFF Sprints, just like I did for the marathon. Expect a post-race report to be posted on Sunday evening! When we decided to move to Switzerland, the way I manage my computers and Internet access had to change. Beforehand, all of the servers for pietbarber.com were served out of a puny linux laptop that I had running on my DSL line here at home. The connectivity was terrible, and when I played online, I suffered lag each time somebody downloaded a document or something. It was just awful. I am a Linux administrator by day at work, and doing new and neat things with computers is what we nerds crave. But as we were moving out of the house to a new adventure in Switzerland, keeping a bunch of dusty computers here in the basement just wasn't going to work out. I discovered Google Apps, where they allowed the whole family to get a GMAIL account, and I could administer everything for everybody. Since I was already a Picasa user, this was a great convenience. I later created a blog, made the website online with Google Apps, and everything was really running swimmingly. Well, very recently, Google changed some stuff around recently, where my Google Apps account, which made it so that I had to log into two different places to view my mail and to read my news groups. This kind of sucked. Also, because of the recent changes to Google Apps, I wasn't able to read email and update the blog (not that I do that very often), or be logged into my YouTube account at the same time. Well for lots of complicated reasons that I don't really want to get into, this is why the Piet Barber blog moved from pietbarber.blogspot.com to blog.pietbarber.com. I also am going to have to make some adjustments to my Picasa account, too; and I hope that won't be to disruptive to the links to pictures that I have out there.